That support, he says, and the superb education he received, helped him achieve the high standards he’s set for his professional and personal success. 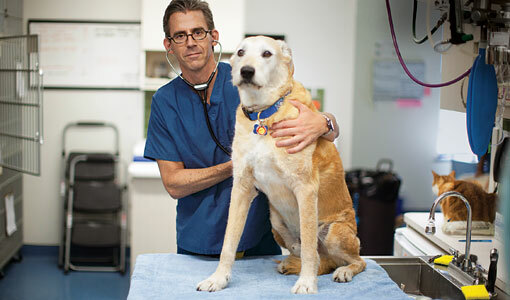 Kaplan, V90, runs his own practice, City Veterinary Care, on New York’s Upper West Side, which New York magazine named the “best private veterinary practice in New York City” in 2002 and 2006. He founded the Toby Project, which aims to make New York City a no-kill community by offering free and low-cost spay and neuter services to low-income pet owners and feral cats. So what makes this civic-minded vet tick? “Passion,” he responds. “I love what I do on a daily basis, so I’m grateful that Tufts took a chance on me.” When he learned that financial aid was a major priority for the Cummings School, he didn’t hesitate, establishing the Dr. Andrew Kaplan Annual Scholarship, which will give preference to a fourth-year student with an interest in shelter medicine. The first recipient was Matt Gordon, V12 (see A Decision Made Easy). Kaplan hopes that recipients of his scholarship will be inspired by the Toby Project, which aims to end pet overpopulation and the euthanasia of thousands of dogs and cats in New York City animal shelters each year. He founded the nonprofit after adopting a tail-thumping mixed-breed dog, which he named Toby, he met by chance at a “mutt show,” staged to promote shelter dog adoptions. He was baffled by a sign on the dog’s cage that indicated the animal was aggressive. He checked up on the dog the next day at the municipal animal shelter and was alarmed to learn that because he was deemed unadoptable, he would be killed in a matter of hours. He pleaded the dog’s case to the shelter behaviorist and brought Toby home.